It took me longer than it should have to figure out the WordPress Settings API, largely because there are certain parameter names that must match if things are to work properly. However, after making good use of the Google and studying the WordPress Codex extensively, I finally figured it out. Otto’s tutorial is from 2009, and Konstantin’s is from 2012, but they are still valid—they got me up and running. However, they are not copy/paste—you need to actually understand what all those bits of code are doing. Because I’m a color-coding kind of person, I also made sure that anything that needs to match is in the same color. Neat, huh? Download this as a pdf here. 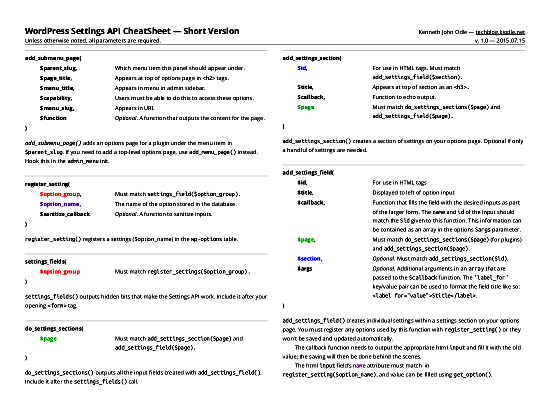 I am far from an expert in the WordPress Settings API, so if you spot errors, let me know in the comments. Also, if you can think of a way this can be improved, drop a comment. Thanks. Thanks for providing the Settings API functions in sequence. it helped me to understand bit more about Admin pages. but some points are beyond of my brain capacity. is it necessary to put all that functions to create a theme option page? Actually, you shouldn’t use the WordPress API to create a theme option page, as all theme options should be handled by the customizer now. The nice thing about the customizer is that it’s actually easier to create and use theme options than the WordPress API. If you’d like, I’ll be happy to write a tutorial for that.